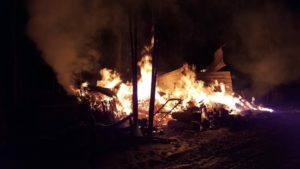 WEST SPARTA – Flames shot up from a West Sparta sugar shack high and bright enough for a Nunda firefighter to see it and call it in from over two miles away. 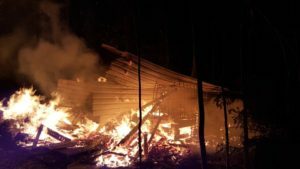 West Sparta Fire Chief Thomas Pearson says that the shack, located on Reed Road, was a total loss, but there were no injuries and the fire was contained to the structure and did not spread into the surrounding woods. The shack had already fallen to the ground by the time firefighters arrived. Flames had towered an estimated 20 to 30 feet to be visible from 436. 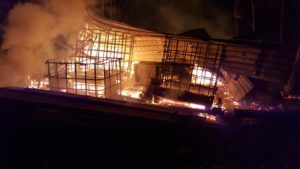 A malfunctioning propane heat source was found to be the cause of the fire.